Il Glicine, Affitto per brevi periodi grazioso appartamento con giardino privato zona centro storico. It is spacious and full of light - a perfect cool retreat after a warm summer day's exploration in Tuscany. Great for just two love birds or for larger parties with children up to 6 people, this accommodation in Cortona even has its own little walled garden, where you can sit and chat in the shade. In the evening, you can let yourself out of this apartment for rent and into Cortona, where you can meander through the public gardens across the street or have a delicious Italian meal on the “piazza”. This apartment is located literally in Cortona’s historic centre; starting from Cortona's main piazza, a walk down the main pedestrian street will end at a ring road. Pass the church, cross the road, and unlock the green door to your own secret garden! Marzia and I are from Cortona and are married since 1988. We have two grown children. We look forward to meeting you and to have you as our guests at Il Glicine soon. Location Location Location...Il Glicine is in a truly convenient and comfortable area of Cortona. It is a very short walk away from the town center and right in front of the tranquil public gardens. We are sure that we can guarantee a perfect quality stay in our house and that you will be satisfied with the choice made. Size Size Size...The most imortant issue about Il Glicine is that it is not just one of the many holiday rental machines 'springing up' in Cortona but is actually a real size house.This guarantees a true Italian experience, uncomparable to what a small hotel or B&B room can offer. 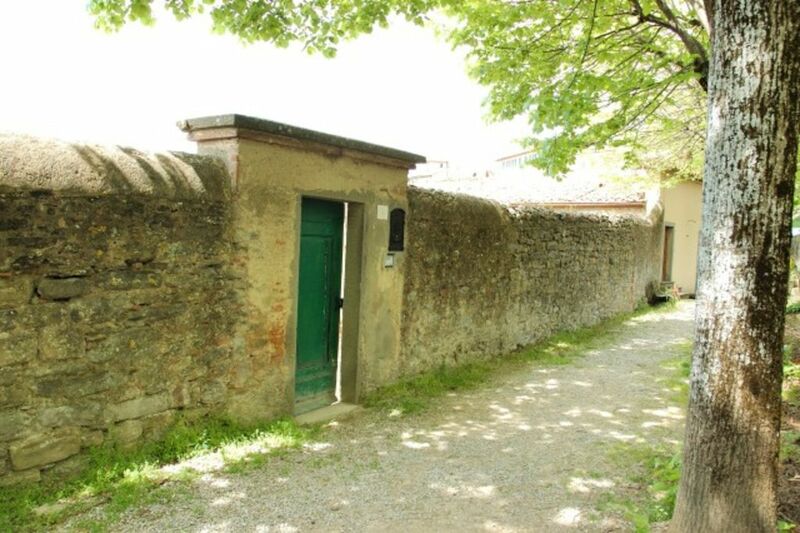 The private walled garden is also a unique asset and very difficult to find in Cortona's town center. Further details indoors: Interior description (80 m2) ground floor: after coming down the steps into the garden and then another half-flight to the front door, you will enter into a hallway. Immediately to your right is a dining room with a table for four, and through an open door is a very small kitchen. The kitchen is equipped with an oven, cook-top, washing machine, toaster, American coffee maker, and Italian coffee maker. Continuing down the front hall, you will find yourself in a large living room with a good quality sofa-bed, TV, and a bookshelf with various English titles. A half-step up through a door in the living room leads into a kind of ante-room, furnished with another comfortable sofa bed for two and a lamp. On one side of this room is the door to the bedroom, which has a 180 cm king-size bed. Another door from the ante-room leads into a large bathroom, which has a sink, toilet, bidet, and a crystal cabinet shower. There is now also a completely free, unlimited ADSL Internet connection, with WIFI in the house and garden. We loved staying in Cortona at Il Glicine. The cottage was very charming and immaculately clean. There was attention to every detail: lots of towels, robes, pillows,dishware. The only issue we had was with coffee. There was only a Nespresso. The pods for the Nespresso could only be purchased at one shop in town and by the time we figured it out, our stay was at an end. But, there were lots of places to get a cup of coffee, so not really a big problem. Other than that our stay was perfect and the cottage was amazing. Il Glicine could not have been more perfect. Such a charming, well equipped apartment. Close to town and all it has to offer. The garden was an amazing place to enjoy a morning coffee or evening glass of wine. We will be back. Wonderful, magical stay in Cortona! My husband and I spent 5 nights at Il Glicine in October of 2017 and could not have hoped for a more wonderful experience. The location is perfect for strolls through the old town and park with plenty of restaurant options and a small market and 'this & that' store in town for essentials. Il Glicine has been lovingly restored by Marzio and Alessandro--the home has a historic atmosphere with all modern amenities (excellent wifi reception, plus a washing machine here). We truly appreciated the details, such as the toiletries and plush robes for our use. Alessandro and Marzia were gracious hosts, and were always happy and available to answer any questions (including navigating our way to Il Glicine on the day of our arrival!). Our favorite things to do were: taking walks in the park above Il Glicine and venturing beyond that to pass by villa Bramasole and through the old town at the very top of Cortona to make our way back to Il Glicine, enjoying a meal at the Bar 500 on Via Nazionale to people-watch during the evening passeggiata / promenade, grabbing a gelato cone to go, and venturing out from Cortona to visit San Gimignano and Montepulciano. We will always treasure our time at Il Glicine and Cortona, and hope to return one day! Perfect, tranquil surroundings, beatuiful home. Cortona is a beautiful town and has a wonderful energy. This home and garden made our trip, we have named the garden 'Prosecco Garden' as we spent some lovely afternoons sitting there sipping prosecco and enjoying the tranquility. The home is beautiful and comfortable. Our host Alesandro was wonderful, helpful and informative. We loved the location of this charming apartment --- just steps away from the Main Street of Cortona. Yet the apartment itself was wonderfully quiet, and the lovely rose garden (with faithful tortoise) added to its air of tranquility. The master bedroom was charming, with a canopy bed and lovely antiques. The apartment offered additional sleeping options in two other rooms, so it could easily accommodate 4-5 people. We loved walking everywhere we wanted to go in town, and enjoyed the longer walk through the park and skirting the town wall. We found several restaurants we really liked, but our favorite was Osteria de Theatro. Alessandro and Marzia were very attentive hosts, helping us deal with a medical emergency and wishing us a hearty hello when we saw them a few times while walking through town. We loved our time in Cortona and in this apartment, and hope that this is just the first of many visits there. The only thing we would change if we could is to add more illumination --- the apartment was a bit dark. Thank you, Alessandro and Marzia, for a fabulous stay in a lovely town. Tuscany is one of the most popular areas in Italy, vibrant and colourful, boasting with tradition and culture unique for this region. You will have the chance to taste the real Italy and enjoy every moment spent in the incredible region. You can visit places of interest, beautiful churches, museum, famous cities and admire the architecture. Starting from Cortona's main piazza, a walk down the main pedestrian street will end at a ring road. Pass the church, cross the road, and unlock the door to your own secret garden! For those familiar with the city, it is located just across the street from the beautiful Parterre Gardens. It is often possible to find ticket parking down the street from the apartment. Built high on a hill, Cortona has been made famous by Under the Tuscan Sun. It is absolutely beautiful from below... and once you get to the top, there are simply marvellous vistas over the valley and Lake Trasimeno. Cortona Tourist Tax 1.5 euro's/person/night, applicable maximum for 4 nights. 12 euro to be paid upon arrival. We can accept payments by: Bank transfer, PayPal, Appartamento in affitto occasionale per brevi periodi grazioso appartamento con giardino privato zona centro storico. NB: Prices may be subject to change at the owner's discretion.